If you’ve ever been bitten by the record collecting bug then you’ll know that certain records on your wants list remain elusive. In my case one such was Death May Be Your Santa Claus by the very underground and rather short lived U.K. rock band Second Hand. I was attracted to this record at the time of my hoarding obsession partly because of the gleeful depiction of Armageddon on its cover, and its fatalistic title, but mainly because I had and still have a copy of the band’s first album, which was released in 1968 and given the oxymoronic title of Reality, a heavily lysergic and increasingly dark trip through a very weird alternate universe. With Esoteric Recording’s re-release of Death… I now get to find out how this talented and utterly out-there band developed. Whereas Reality featured the swirling and squalling effects laden guitar of Bob Gibbons, Death… required a radical rethink in direction and change in sound brought about by Gibbons suffering a breakdown following the death of his father, and subsequently leaving the band he had helped form and played a prominent part in. This led to keyboard player Ken Elliott taking up the reins, and rather than replace the guitarist they decided on a keyboard led direction. Formed in 1965 by mid-teenagers Ken and his drummer friend Kieran O’Connor, these two were now the fulcrum of the group. Imagine if you will a triangle drawn between three of the band’s contemporaries, namely early The Nice before bombast got the better of Emerson, cerebral Cantabrians Egg, and the mental floss of Arthur Brown’s Kingdom Come, and Second Hand reverberate rather neatly in the middle, drawing influence from all three. Comparisons are odious, I know, but we have to start somewhere. 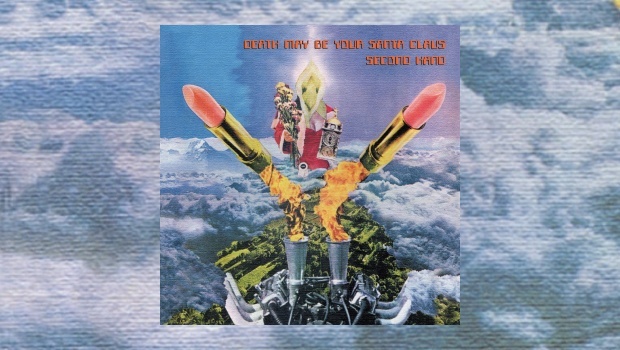 It is fair to say that Second Hand are much more than this, and Death May Be Your Santa Claus is something of a lost treasure of early progressive rock from a time when music like this was simply called “Underground”. Ken Elliott is a fantastic keyboard player and the equal of his peers in dexterity and imagination. Unwittingly the seeds of symphonic rock were sown here as much as Emerson did the same with The Nice. Ken mixes grandeur with spacious and odd synth explorations that never fall into cliché, this being a welcome hangover from the acid rock trip of Reality. Not to mention jazz stylings aplenty which take the record down the Canterbury road. Hangin’ On An Eyelid could be Egg, but turns out to be somewhat atypical as the album gets increasingly psychedelic as it develops, with a few obvious borrowings from the world of classical music thrown in for good measure. The Kingdom Come-like wigout that is Lucifer And The Egg segues into the Vincent Crane funk of Somethin’ You Got that alternates its urgent shouted refrain with Ken’s stunted organ boogie and breathless grunting! Great stuff! The last four tracks of side two of the original record is actually an oddball psych/proto prog symphony that flows from beginning to end in suitably lysergic fashion. It comes as no surprise then, to learn that parts of this album were originally recorded as a score for an obscure film of the same title as the record. Released on the 1st April 1971, this album was not a joke, but a truly imaginative trip into what can only be described as proto-prog, and because of its wit and imagination, not to mention its bravado and sheer craziness, it has withstood the test of time well. Poor sales, and a third album after a name change to Chillum that sold even less led to the band disintegrating in 1972. Listening to Death May Be Your Santa Claus now leads me to suspect that Second Hand were simply too forward in their thinking for the already staid audiences of the time, and you know what sticklers for repetition a prog audience can be, eh?